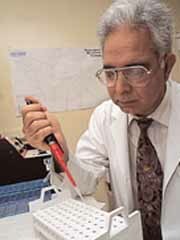 J. L. Mehta, M.D., Ph.D.
Dr. Mehta was the first researcher to describe the important role platelets play in the formation of occlusions in coronary arteries narrowed by atherosclerosis. This concept, developed more than 20 years ago, established the foundation for the use of thrombolytic therapy and use of anti-platelet drugs in patients with myocardial ischemia. Subsequently, Dr. Mehta conducted a number of landmark studies demonstrating the phenomenon of “reperfusion injury,” in which he demonstrated that modulation of leukocytes, leukocyte adhesion molecules and free radicals could significantly reduce the phenomenon of reperfusion injury. In recent years, he has developed interest in the mechanisms leading to uptake of oxidized low-density lipoproteins (LDL) in human coronary artery endothelial cells. He has demonstrated the presence of specialized receptors on the coronary artery endothelial cells, which are involved in the uptake of oxidized LDL. In these studies he demonstrated that oxidized LDL upregulates its own receptor, which facilitates the uptake of oxidized LDL. He defined the signal transduction pathways leading to cell injury (apoptosis and neurosis) in response to ox-LDL. In these exciting studies, he has demonstrated an important interaction with another mediator of vascular tone and cell injury, angiotensin II, and identified upregulation of LOX-1 receptors by angiotensin II. These exciting studies have shed new light on the interaction between oxidized LDL and angiotensin II and provide potential for novel therapies in the treatment of atherosclerosis.